I would like to begin this entry by first saying THANK YOU to everyone for your support. We have received many donations over the past six months that have helped Tyson in his recovery. The funds donated contributed directly to Tyson’s in-home physical therapy and in-home nursing expenses, both of which are extremely costly but absolutely mandatory to support Tyson’s road to recovery. Without your help, Tyson would NOT be making this wonderful progress. Additionally, the outpour of love and encouragement from the many of you who’ve reached out or who hold us in your prayers, has all meant so much to us. It’s difficult to put into words just how much of an impact your generosity has made, but please know that you are all responsible for helping Tyson continue to make this unbelievable come-back! Thank you!! These past few months have continued to be productive ones for us. Tyson is doing well and is maintaining steady progress. He looks really good and healthy. Dr. Horowitz has developed a Lyme protocol for Tyson that seems to be working quite well, as we are witnessing Tyson’s body come back to life. He is on a wonderful supplement regimen that includes lots of vitamins, glutathione, NAC, and some others that again, are all contributing to Tyson’s improvement. During our most recent conference call with Dr. Horowitz, he commented on Tyson’s progress and said, “here, we have a man who has survived something he should not have and is now making tremendous strides in his recovery…we cannot disrupt this treatment plan”. Essentially, whatever we’ve stumbled on in terms of his care, his meds, his supplements, and his therapy cannot change because it is working. There has been NO decline whatsoever and within the past few weeks in particular, he has really made some wonderful breakthroughs in physical therapy. ​The next video is great- the day I took this video, Mike and Siobhan had just worked with him in side-lying position to help work on and engage his core. After those sets of exercises, we were about to position him on his back so that we could get his sneakers on and transfer him into his chair. As we were about to move him, we noticed he mouthed to us the word “watch”. So, we all backed up for a second and Tyson began rotating his shoulders back and then forward and even threw in a couple shoulder shrugs! We all were cheering and cracking jokes about Tyson showing off…he flashed us the biggest smile. I love when he does this. Tyson and I are constantly reminding ourselves of where we were a year ago when he could only blink or eventually only smile on one side of his face and even two years ago when he was SO thin and struggling for every breath. We do this to acknowledge our progress and stay grateful. When Mike first resumed therapy with Tyson after his cardiac arrest, there were times when he would feel a flicker in Tyson’s muscles but Tyson didn’t necessarily feel it or, if he did, wasn’t that impressed with it. What I love now is seeing Tyson’s face light up when he feels new muscle contractions or when those contractions are stronger. THAT is how I know he’s going to be okay. That feeling is addicting and is super motivating! This week, in fact, Siobhan and I had Tyson sitting at the edge of the bed and she put his elbow out to the side and leaned his body weight on it, like a side bend. Then, she guided him up to an upright position. The point is to go through the motions to work on the strength aspect but also to remind his brain how to move his body. After one rep, Tyson lit up and said “I’m doing it! I can feel it”. We are literally building on this every single day. The muscle contractions throughout his body are getting stronger and the ranges are getting bigger. The focus is on the core and the strength will radiate from there. Tyson even felt flickers in his calves and a *baby trace* of a flicker in his foot which is astonishing. The thought is that the first to go will be the last to come back (feet and hands). The therapists and I could tell him every day how strong he’s getting, but it almost doesn’t matter unless he acknowledges it. Another really wonderful and important thing to point out is the lasting and continuing effects of the stem cells that Tyson has in his body. His last set of injections was over a year and a half ago in December 2014. They don’t reach their peak maturation for 2-5 years so he is still benefiting immensely from them as well as the stem cells from his very first round of treatment in February 2013. That, coupled with the fact that he’s getting the right amount of nutrition and hydration and the constant PT (which sort of directs them where to focus), it’s no wonder he’s making improvements. I know many of you are curious about how we will resume stem cell therapy for Tyson and I assure you, it is a top priority for us and I hope to be able to share some news on that front very soon. The boys are both doing very well. Calvin will graduate from preschool soon and Abren will turn two next week! They are both really good boys who always want to help and above all, they bring so much joy to me and Tyson. Our little family dynamic is pretty special. On the one hand, it feels like an incredible tragedy that Tyson is in the condition that he’s in. We can’t hear his voice, he can’t participate in a majority of the things that go on in the house on a daily basis, and sure- a part of him is gone…for the moment. I cannot explain the pain that is associated with these facts. Having said that, we realize that the real tragedy would be if he wasn’t here at all. But the truth is- he is here with us and we have a new “normal” that is pretty awesome. We are absolutely making the very best of our current situation by creating new traditions and habits, however small they may seem. 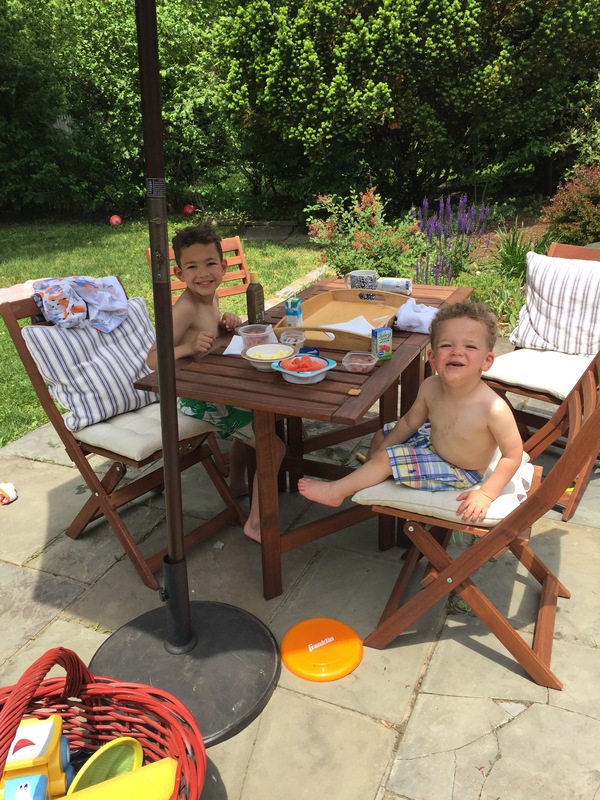 For example, Calvin and Tyson still love to watch baseball and basketball together in Tyson’s bed, and sometimes, if he’s lucky, Calvin will make him watch a YouTube video of a Hotwheels demonstration and believe me, you haven’t lived until you’ve seen one of these videos 😉 Abren adores Tyson just like Cal does. And just like his big brother, Abe loves to dance. He shrugs his shoulders up and down when he sees Tyson and Tyson will shrug his shoulders back in response. It’s amazing to see them bond and communicate without saying a word. ❤️ The kids love to put on a show for Tyson with some breakdancing after dinner. We laugh pretty hard at the two of them. At the start of Tyson’s illness when he was eventually unable to use his arms to give us hugs, he and Cal (who was two at the time) came up with something they called “twisties”. They’d put their foreheads together and twist, or sort of rock side to side and that was their way of giving hugs and having something special between them. Anyway, Cal taught Abe how to do it and now they both do twisties with Tyson. So sweet. Abren and Tyson also have another cute way of communicating with each other. Tyson blinks his eyes rapidly at Abe, and then opens them wide, and then makes a kiss-face, and Abe mimics every step. It is so cute (and it’s pretty good exercise for Tyson, too!). Tyson has such a special relationship with both of the boys. Of course I cannot leave the house without having a nurse here for Tyson which isn’t a big deal. 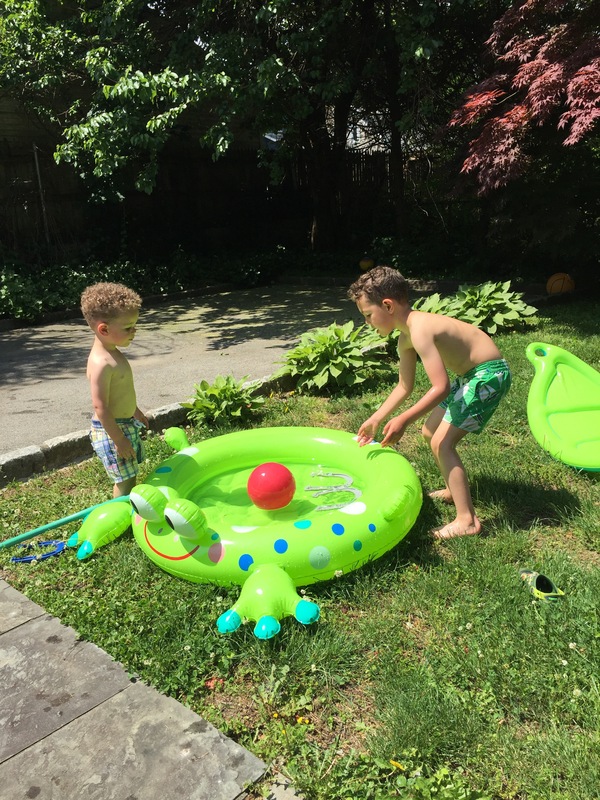 I have groceries delivered and try to make our backyard as fun for the boys as possible in lieu of trips to the playground or the beach. We have wonderful friends here that we’ve met through the daycare. 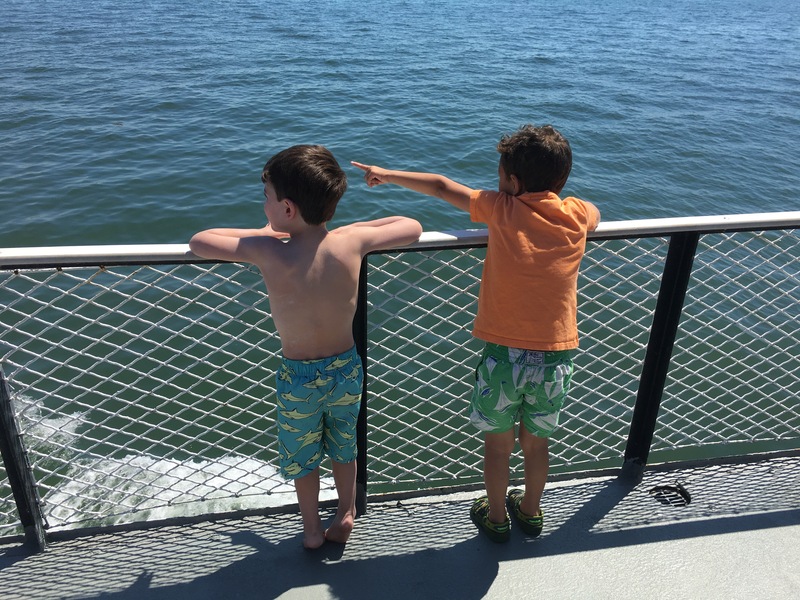 They help us to make sure Cal attends every birthday party and today, for example, he’s at Island Beach with his buddy for the day! (That’s Cal on the right) With everyone’s support and our effort here at home, Cal and Abe have a pretty normal life despite everything that’s going on. That has always been a priority for Tyson and me. Many of you may have read recently of the major restructuring that is underway at Ralph Lauren. In an effort to rebuild and revamp the company, they have unfortunately made the decision to lay off roughly 1,000 full-time employees. This makes up about 8% of all of the 15,000 full-time employees. Last week, I was a part of that 8%. Naturally, I am extremely devastated. I have worked for RL for the past 13 years and it has truly been a part of my identity. It is where I met my husband. It also took me to places like Nantucket and Aspen, which I was fortunate enough to call “home” for a while. Aside from the nostalgia aspect of leaving RL, this change has obviously added a tremendous amount of stress to an already overwhelming situation with Tyson’s medical condition. 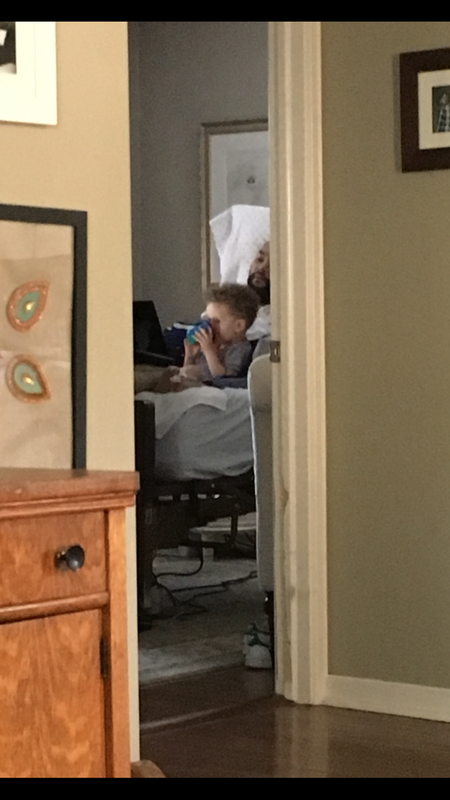 Almost every day is difficult enough as it is and there are mounds of things I need to tackle on Tyson’s behalf to ensure he has all systems in place for his road to recovery. Adding a layoff into the mix is certainly not ideal and is poorly timed. However, I’ve resolved that I cannot get upset over something I cannot change; all I can do is figure out how to move forward. We will take this as a blessing in disguise. Tyson needs me here with him to help in his recovery. For example, I can be more present in each PT session and we can work more consistently on the vent weaning. I want to be clear that I fully understand the need for restructuring and Tyson and I will be forever grateful for everything Ralph Lauren has done for us. We have had a tremendous amount of support from our RL family over the past five years that without, I’m afraid to think of where we might be today. We will make the most of our time together and figure out a way to stay here and make this work for Tyson’s sake. Father’s Day is Sunday and we will spend the day together and do what we can to make Tyson feel special and loved (I’m telling you now, it’ll probably involve a dance-off 😉). Happy Father’s Day to all of the dad’s out there and a special Happy Father’s Day to my dad and to my husband because these are two guys who go above and beyond to be the best dads around 😊. I’d be lost without you both! Thank you all again for your prayers, positive vibes, and support. Hopefully, I will have a stem cell update for you in the near future! Thank you so much for this beautiful post. Tyson and your family have remained in my prayers and thoughts and I am thrilled to read of all the good things happening in your lives. More importantly- the absolutely unimaginable strength and positivity that you display. You are doing such a fantastic job caring for Tyson and your family and working through both the grief and stresses of your situation, and doing it with such grace. They are all blessed to have you! I grinned from ear to ear seeing the videos and my heart kept saying- “he’s coming back.” 🙂 I will continue my prayers for your family and I look forward to witnessing this journey as you and Tyson fight his way back! Hey Ann and Tyson. I was and am so happy to have heard from you. God has a plan for your lives and only He knows what it is. This experience is making you stronger each day. The strength you have you probably never thought you had. God is in the midst of your lives, call on His name when down and out, full of rage and fear, whatever He will never leave you nor forsake you. Find a ace in your house, call it your prayer closet and shout out to God anout how you feel and what you need and want. Speak out loud, He already knows, He wants you to depend on Him. We cannot do things that seem impossible in and of ourselves. We need Him and He wants us to need Him and lay all our burdens, worries, cares wants and needs at His feet. Let go and let God.